GIVE YOUR CAREER A GREAT FOUNDATION..
Games: Archery, Athletics, Artistic Gymnastics, Baseball, Basketball, Boxing, Canoeing, Cricket, Cycling, Fencing, Football, Handball, Hockey, Judo, Kabaddi (N/S), Kayaking, Karate, Kho-Kho, Pistol Shooting, Power-Lifting, Pencak Silat, Rifle Shooting, Rowing, Rugby, Rhythmic Gymnastics, Softball, Swimming, Taekwondo, Volleyball, Wrestling, Weight-Lifting, Wushu. At a glorious 52, BBK DAV College for Women stands tall as a provider of Quality Higher Education on the national horizon. 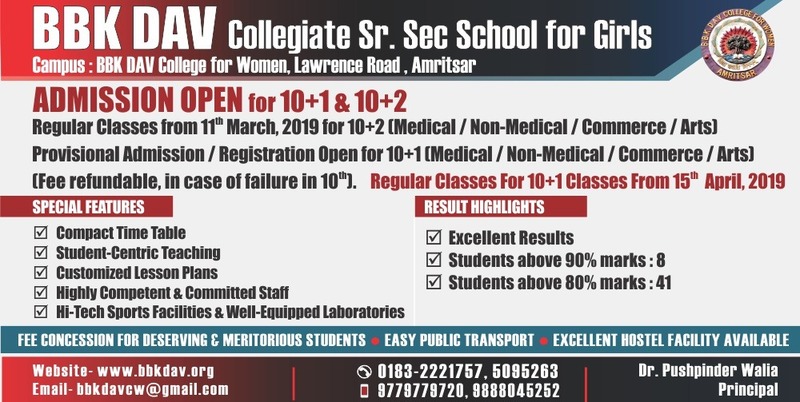 It was founded in the year 1967 under the aegis of DAV College Managing Committee, New Delhi, with the avowed aim of spreading the benefits of education to women, synchronizing tradition with modernity. A multi faculty institution, that aims to blend professional & vocational education with traditional courses, it is an excellent model of what a women’s college can do for women’s development. The thrust of the college is on the highly innovative and efficient management of all its resources – human and Infrastructural. The history of fifty years shows an endless desire to be in pace with vocation-oriented education and challenges of technology, communication & media. The choices that you make today determine the quality of your tomorrow. By choosing BBK DAV College for Women, you have chosen an institution where excellence is pursued and perfection is achieved, where methods and materials are constantly overhauled to meet the ever-changing trends and where challenges are turned into possibilities of exploration, advancement and enrichment. Dainik Savera honoured Dr. Pushpinder Wala for excellence in the field of education.